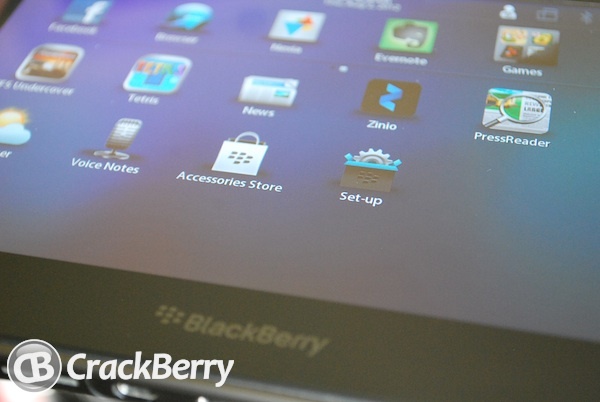 We've been hearing rumors non-stop for weeks now, and it looks like the 4G BlackBerry PlayBook is finally upon us. The new PlayBook supports 4G LTE networks and is available first in Canada with other regions including the US and Europe to follow. While there is no mention of price, the 4G LTE PlayBook will be available in with 32GB of memory from Bell, Rogers and TELUS in Canada on August 9, 2012. WATERLOO, ONTARIO--(Marketwire - August 02, 2012) - Research In Motion (RIM) (NASDAQ: RIMM)(TSX: RIM) today launched the new 4G LTE BlackBerry PlayBook tablet with built-in support for cellular networks. The new 4G LTE BlackBerry PlayBook maintains a sleek and ultra-portable form while delivering overall faster performance over the original BlackBerry PlayBook, as well as support for blazing fast 4G LTE networks. Launching in Canada first, the new 4G LTE BlackBerry PlayBook allows customers to work more productively and connect to the Internet, as well as access their email, on-line apps, media and content, from more places than ever. "We're excited to bring customers the first BlackBerry PlayBook tablet with support for 4G LTE networks," said David J. Smith, Executive Vice President, Mobile Computing at Research In Motion. "The new 4G LTE BlackBerry PlayBook offers a broad range of premium features, including a stunning 7 inch display, front and rear facing HD video cameras, HDMI out and stereo speakers, and it also offers premium performance on high speed cellular networks, helping customers to be more productive than ever and to make the most of their time on the go." Featuring the latest BlackBerry PlayBook OS 2 software, the 4G LTE BlackBerry PlayBook tablet gives customers access to high speed mobile networks around the world (LTE and HSPA+)(1) and offers an exceptional, high-fidelity, fast web experience that supports more HTML5 functionality than any other native tablet browser on the market(2). The powerful unified inbox allows users to easily manage multiple personal and work email accounts, as well as messages from Twitter®, Facebook® and LinkedIn, all in one place. The built-in Calendar and Contacts apps offer features to help customers better manage schedules and prepare for more effective meetings. Plus, the apps' unique integration with social networks can provide customers with a wealth of information about their contacts at their fingertips. The 4G LTE BlackBerry PlayBook tablet is also enterprise ready. It can be easily managed with BlackBerry Mobile Fusion and includes BlackBerry® Balance technology, which allows a user to use a BlackBerry PlayBook for both work and personal purposes by keeping business information highly secure and separate from personal information. Out of the box, the 4G LTE BlackBerry PlayBook tablet comes preloaded with the tools customers need to be productive as well as to have fun, whether in the office, at home or on the road. Thousands of apps for work and play are also available on the BlackBerry App World storefront, such as the recently launched BlackBerry Video Store for all PlayBook customers in Canada, bringing additional functionality and value to customers. The BlackBerry Video Store offers a catalog of thousands of movies and TV shows. Customers can begin watching media as soon as they start to download a file, so they won't have to wait for the entire file to transfer before they can begin enjoying great entertainment on the tablet's high resolution display or on an HDTV using the BlackBerry PlayBook tablet's HDMI output. Canadians can download the free Video Store app on BlackBerry App World. The 4G LTE BlackBerry PlayBook tablet will come with 32GB of memory storage and will be available from Bell, Rogers and TELUS in Canada on August 9, 2012. Additional variants of the BlackBerry PlayBook tablet supporting various high speed cellular networks are expected to be available in the coming months from carriers in the US, Europe, South Africa, Latin America and the Caribbean. (1) LTE connectivity is currently only available from a limited number of carriers in specific countries. Where LTE is not available, the 4G LTE BlackBerry PlayBook tablet can automatically adjust to connect on HSPA+. (3) Check with your wireless service provider for availability, terms and conditions.